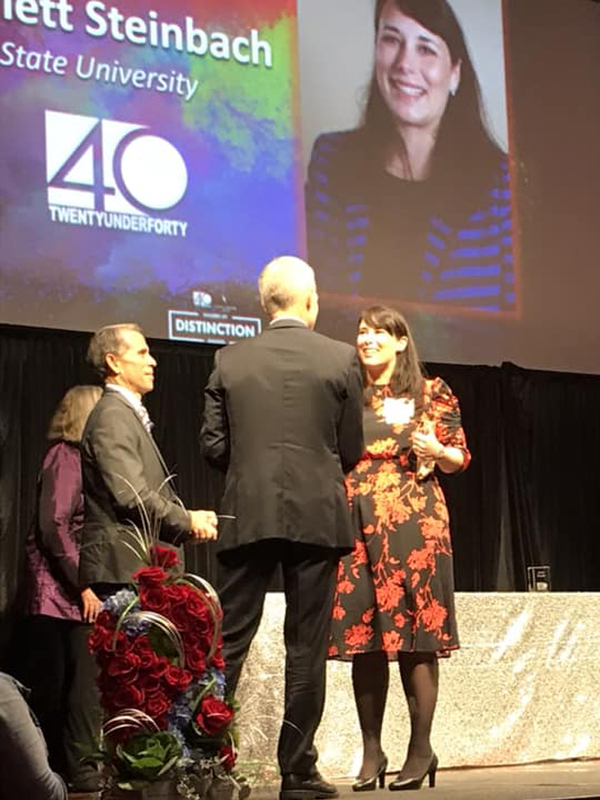 During the Leaders of Distinction dinner on October 10, 2018, Harriett Steinbach, assistant director at the Center for Community Engagement and Service Learning, was honored as one of the Pantagraph’s 20 under 40. 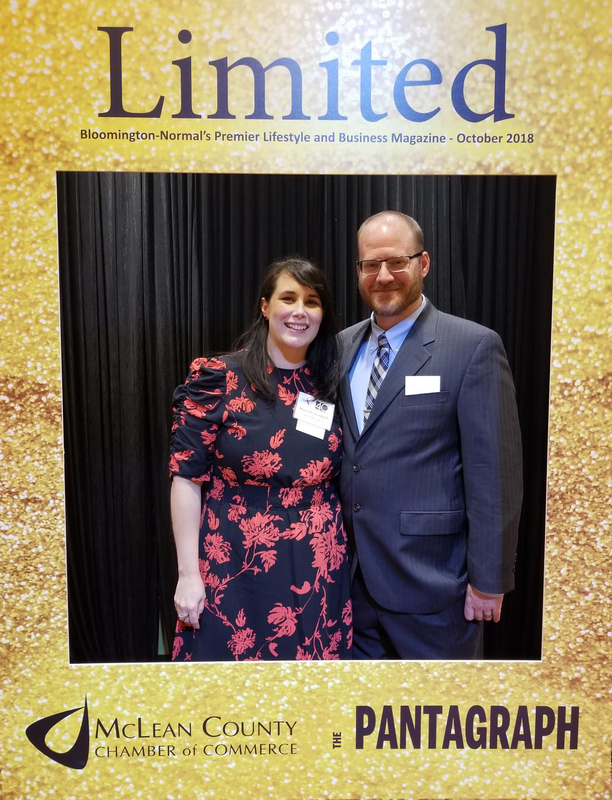 The 20 under 40 program recognizes young professionals who excel in their careers, are passionate about the community and are making a mark in Central Illinois. Steinbach certainly meets all three criteria. Steinbach has also exhibited strong community involvement, both through her position at Illinois State University and her work within the community. In fact, since joining the University in 2006, Steinbach has spent the majority of her time working with civic engagement, whether that be community service or student engagement with the Town of Normal government. She joined the center when it was established in 2017 and worked through the Dean of Student’s Office prior to that. In her most recent position as the assistant director for service learning at the center, Steinbach works strategically to establish partnerships between the University and community organizations. She recently created the Community Consulting Board to help inform work and decisions made through the center. Steinbach also provides leadership and oversight of the existing co-curricular programming provided by the center, the majority of which involve existing community partners. Before starting at Illinois State, Steinbach worked for nonprofit organizations within the community—the Salvation Army and the McLean County Museum of History. 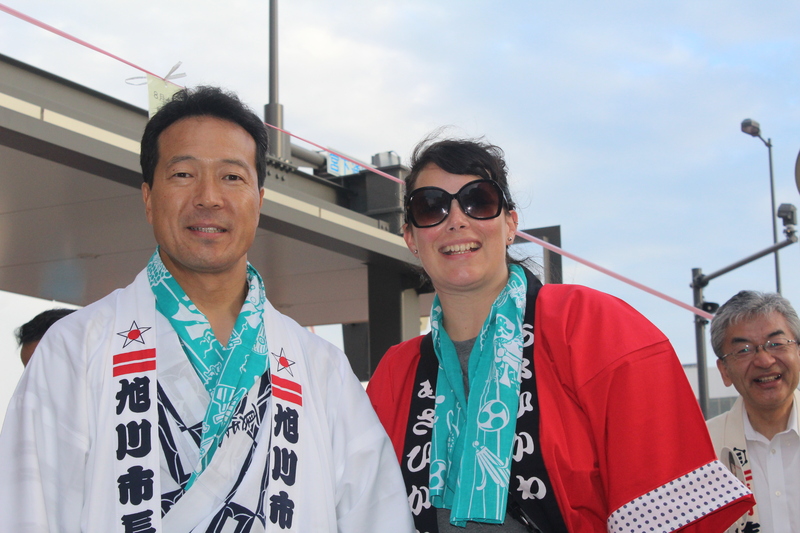 Steinbach has volunteered extensively with the Bloomington-Normal Japanese Sister Cities Commission and was even named an honorary citizen of the City of Asahikawa, Japan, in 2017. She served as a board member for the Community Health Care Clinic, and she has also facilitated leadership development sessions for Youth Global Citizen. Steinbach was also part of the Neighborhood Action Team that received the 2016 Innovation By A Team award from the Division of Student Affairs. The group earned the award for their development of a three-tiered intervention strategy to address student behavior issues in neighborhoods near campus. In 2015 Steinbach received the Academic Advising Advocate Award through the ISU Academic Advising Council. She received the Outstanding New Professional Award in 2009 from the Division of Student Affairs as well as the Outstanding Staff Member Commitment to Diversity Award from Diversity Advocacy. And in 2011, she was on the Cultural Competence Committee and received the Promotion of Diversity Award from the Division of Student Affairs. Steinbach also received the Staff Member of the Year Award from Break Away in 2011. She was nominated for this national honor by students she was advising through the Alternative Breaks program. Steinbach chaperoned a group of junior ambassadors from Asahikawa, Japan, when they visited Bloomington-Normal in 2009. 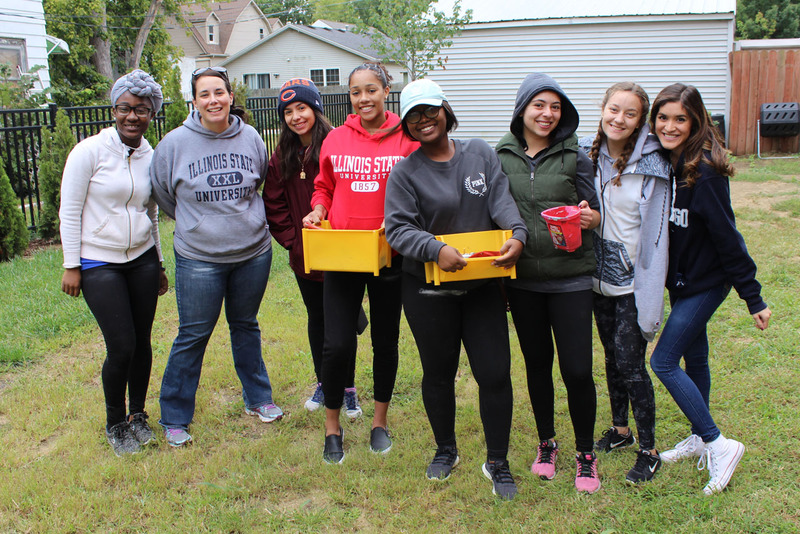 Harriett Steinbach poses with students who helped the West Bloomington Revitalization Project with a sale at the Tool Library during September Service Days.